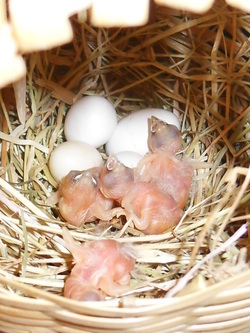 One day after hatching in Luna's nest. Two weeks old in Luna's nest. 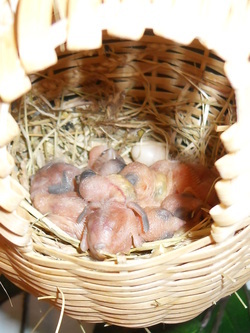 The two darker chicks turned out to be Cherry finches. At one week old in Luna's nest. Two and a half weeks old in Luna's nest. The Cherry chicks were so much smaller than the Bengalese chicks. 20/02/12: The images above are from just one nest which had chicks at the time. 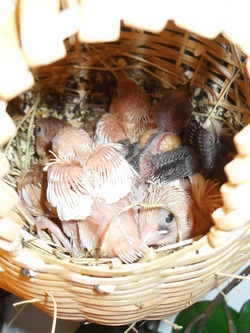 There was another nest with six chicks in the same cage, but at the opposite side. 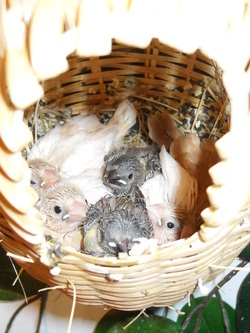 The cage is currently abit cramped with four adults and twelve chicks, but now they are nearly five and six weeks old, the juveniles are independent so we plan on splitting these adults and chicks equally between the two cages later in the week.